The Saturn blimp was built in the hangar in Elizabeth City, North Carolina. The hangar is one of three blimp hangars left in the United States. Built in the 1930's, it served the U.S. Military for blimp production. Once leaving the facility, the Saturn Lightship made its inaugural journey across North America. In addition to providing live aerial television footage of NCAA and professional sporting events, the lightship also appeared at Saturn promotional events and retailer sponsored activities. A primary function of the Saturn Lightship was to supplying television networks with aerial footage to complement their broadcast of specific events. For scheduled network television events, many of which will be sporting events, the Saturn Lightship will utilize an aerial platform and gyrostabilized television camera to provide viewers with a variety of aerial angles. 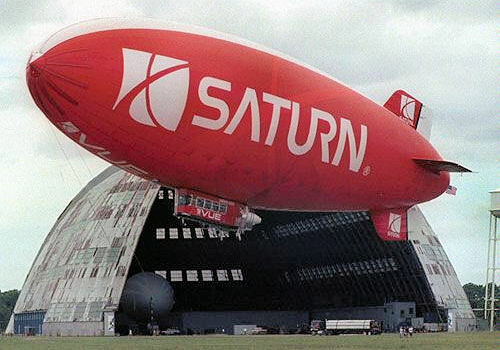 In September of 2004, the Saturn Lightship established a new world class flight duration record for Class B non rigid helium airships with volumes from 3000 cubic meters to more than 100,000 cubic meters when it flew for 24 hours, 40 minutes, and 55 seconds, landing at 11:10:40 pm tonight at the Long Beach Airport. The previous record of 14 hours and 9 minutes was established in 1998 in White Plains, N.Y. This demonstration of long endurance emphasizes the ability of the airships to fulfill a number of roles including persistent airborne surveillance. Counter insurgency, pipeline protection, border patrol, ports and harbor security, airborne law enforcement and protection of key facilities can greatly benefit from the ability of the airship to remain on station for extended periods of time. On occasion, the Saturn Lightship has assisted government agencies with security efforts. The Saturn Lightship was piloted by Carl Harbuck and Douglas McFadden of The Lightship Group of Orlando, Florida, and spent the entire flight in the greater Los Angeles metropolitan area. The Lightship was manufactured by The American Blimp Corporation based in Hillsboro, Oregon, which had a long-term contract with the Saturn Corporation. On board the flight was a barograph which established that the airship did not land, in accordance with the Federation Aeronautique International (FAI) which establishes the rules for world records. The National Aeronautic Association is the U.S. representative to the FAI and will certify this new record. Check the SaturnFans.com Lightship photo gallery for more pictures of the blimp, along with photos of when it crashed at an air field in Las Vegas on May 22, 2004.